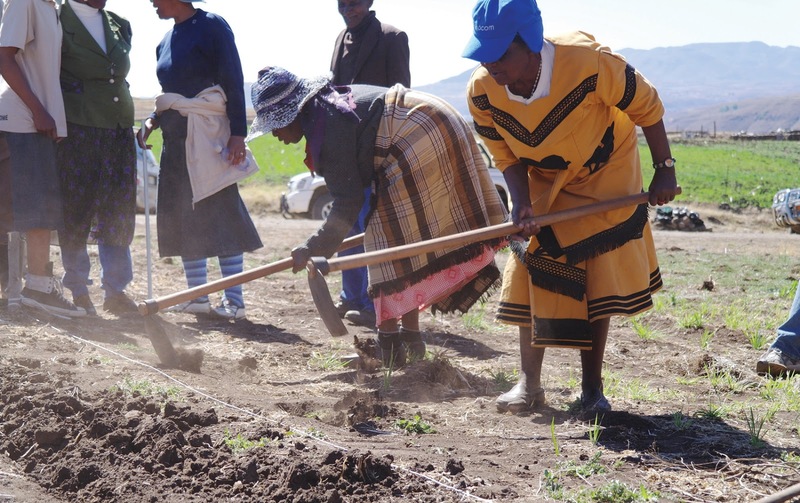 MASERU: Conservation Agriculture (CA) has evolved in Lesotho for over the last 30 years and is viewed as a means for climate change adaptation and a mitigation measure in the form of new agricultural practices. But lack of information, limited access to technology and insu­fficient capital appear to be some of the main barriers to its adoption as a recommended and general farming practice. The CA Strategy 2012 positions it as a high potential for adoption if the constraints around availability of direct planters could be solved. Being used interchangeably from the Climate - Smart Agriculture (CSA) method, Lesotho believes that if well adopted and implemented, CA could help the country increase agriculture productivity, strengthen famers’ resilience to climate change, reduce agriculture’s loss and also increase the country’s capacity to feed its population. According to the Lesotho Climate Change Baseline and Trend Analysis Report, climate smart agriculture method is used interchangeably with CA locally due to the nature of their similarities. Some stakeholders, for both climate change and agriculture, believe there is need for climate smart agriculture programmes in Lesotho and that there needs to be further research on this method with the enhancement of awareness to the local farmers on it. On the other hand, some believe that there is still more to be done on CA itself. A former Ministry of Agriculture and Food Security officer, Khathatso Maraisane, believes that the introduction of CA in the agricultural ministry has not been definite from the onset - with some of the farmers not well trained on this programme. The Baseline Analysis Report also states the need for awareness raising and training especially at community level to enhance adoption of this technology. But government appears to be making good progress in its support to CA working in collaboration with key players that include non-state players and other civic bodies. Support comes from international organs such as the Food and Agriculture Organisation (FAO), which provides subsidies to farmers who adopt the CA technologies and organic farming programmes such as key garden holes, which targets people living with HIV/AIDS. In its effort to encourage the adoption of CA technologies, FAO established a local Conservation Farming Network Group to also facilitate the exchange of experiences, knowledge and ideas between organizations after the Conservation Agriculture: way for Lesotho CA re-introduction in 2000. Later in 2007, the CA national task force was established and is responsible for coordinating the national activities of organisations working to support introduction and promotion of CA. FAO and the World Food Programme in both the private and public sector provided the initial funding of the programme. There is a strong belief that there are many efforts to promote CA in the country that includes more advocacies, exploration and more investment on CSA technologies other than the CA only. The European Union (EU) Lesotho Programme Manager for Water, Energy and Climate Change, Sjaak de Boer, emphasise that CA is the only way forward in addressing agriculture production in Lesotho. The Minister of Energy a n d Meteorology, Selibe Mochoboroane, also holds the view that the country should be using CA as a means to adapt to climate change’s negative impact. “Extreme climatic events such as prolonged and intense droughts are becoming normal features of our climate in Lesotho where new records of temperature, rainfall or intense heat are set with an ever increasing frequency. “This further demonstrates the magnitude of the influence of climate on life itself and also on primary production systems. As a result of climate change, it is not just species but also people that are suffering and will increasingly suffer unless decisive actions are taken,” Mochoboroane stated. The fear is that since the country is highly vulnerable to the adverse impacts of climate change (according to the vulnerability assessments undertaken), this might hamper the country’s efforts in achieving sustainable development and poverty alleviation, hence the need of great support for CA which is said to have the ability to strengthen national food security and unlock climate change economic opportunities if well adopted and implemented. CA in Lesotho is doing very well so far, and this is according to the department of crops in the Ministry of Agriculture and Food Security. According to unpublished data in the ministry, key CA technologies that are used in Lesotho include likoti (basins), ox drawn and mechanised, tractor drawn no-till planters. Basins are said to be the most common practice mainly because the method is less expensive and as such, many farmers (about 16, 579) have been practicing it since CA adoption. It further appears that for the period 2012 to 2014, about 24, 010 farmers were trained on CA while about 23, 741 farmers from different organisations received inputs through initiatives aimed at promoting CA and for the same period, CA demonstrations totalling 1, 279 were conducted. According to the Baseline Analysis Report, CA in Lesotho prescribes adoption of three main principles; minimum soil disturbance, permanent maximum soil cover, and crop rotation and/or intercropping. The current practice of CA was re-introduced in Lesotho in 2000 by the faith based Africa Inland Mission, now known as Growing Nations, in Qacha’ Nek, and Rehobothe Christian Church in Botha-Bothe. The CA initiatives were later adopted and promoted by several other NGOs and farmer groups in Lesotho. Lesotho is reported to be prone to many environmental and climatic stresses mainly droughts, snowfall, hailstorms, winds, localised floods and land degradation due to poor land management practices and these stresses are aggravated by climate change. The agricultural sector, which used to be a major contributor to the GDP, is declining significantly with the recent findings revealing that area planted to maize, wheat and sorghum for 2014/2015 decreased compared to 2013/2014 agriculture year. While maize, wheat and sorghum cereal yields for the 2014/2015 agriculture year are estimated to decrease, a similar decline is also expected in the production of these three crops (2014/2015 Crop Forecasting Report). Lesotho’s Second National Communication to the Conference of Parties of the United Nations Framework Convention on Climate confirms that projected increase in precipitation from September to November for the northern parts of Lesotho for the period 2010 to 2040, will positively impact on the yield of these crops. Therefore, the Lesotho government is highly expected to strongly show its commitment to the development and/or adaption of agricultural policies to take into consideration climate change, its potential impact and ways to overcome or minimize its effects. Agricultural production is a substantial contributor to national income with maize being the country’s staple food where a large proportion of poor rural households have access to agricultural land. However, under the current projected increase in temperature on climate change scenarios for Lesotho, it appears that most crops will not have optimal growth and, as a result, will have reduced yield to varying degrees - (Studies by the Intergovernmental Panel on Climate Change (IPCC) and Lesotho Meteorological Services). Adaptation measures in response to climate change driven by local farmers’ initiative as well as government advice are said to have occurred to a limited extent in the country on an individual basis as well as organised groups. Measures to reduce yield variability or total crop failure are currently being addressed by some farmers through the use of CA techniques, especially in vegetable production where water collection and conservation ensure moisture availability to plants relay and through intercropping as in the implementation of the locally developed Machobane Farming system. Lesotho ratified the United Nations Framework Convention on Climate Change (UNFCCC) in 1995 and subsequently ratified the Kyoto Protocol in 2000. As such, Lesotho is obliged to adopt and implement policies and measures designed to mitigate and adapt to the negative effects of climate change. Lesotho will likely face serious climate change challenges that may have adverse effects on the economy and livelihoods of the Basotho people, especially those living in the rural areas who are poor and have few options for adaptation.